Behold Beelzebufo ampinga, the Devil Frog — a prehistoric frog 40 cm long, larger than any present-day frog. The news of Beelzebufo’s discovery was announced more than two years ago, but I only heard about it last week. You’ll note that in the above image from Wikimedia Commons by Nobo Tamura, it’s shown eating a small theropod dinosaur — because ancient creatures that could (or did) eat small dinosaurs are inherently interesting for some reason. Beelzebufo will look familiar to people who know their frogs, because it was a ceratophryine frog: South American horned frogs, sometimes sold as “Pac-Man frogs” in the pet trade, and known for their general belligerence and willingness to nom. But Beelzebufo was different: it was larger, of course; but it lived 65 to 70 million years ago — in Madagascar, and ceratophryines were thought to be native to South America. 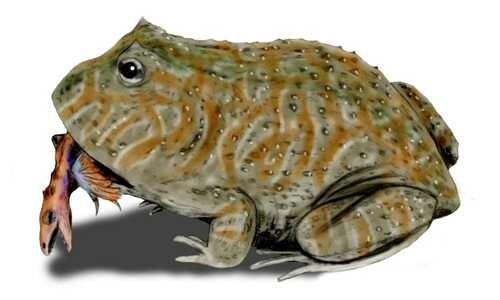 As a result, Beelzebufo’s discovery is significant in terms of the timing of the breakup of the Gondwana supercontinent. South America and Madagascar were parts of Gondwana that were isolated from the rest of the world, biologically speaking, until relatively late. India and Africa met Eurasia tens of millions of years ago, but the Great American Interchange only occurred three million years ago when the Panamanian isthmus formed. Prior to that point, South America maintained some deeply weird fauna, some of which is still around. The neat thing is that there is at least one other group of animals found only in relict areas of Gondwana: boas. More specifically, true boas, such as boa constrictors, rainbow boas, and anacondas. Boas moved into Central America, Mexico and the Caribbean during the Interchange, but they’re also found in Madagascar and Réunion (such as Dumeril’s Boa) and on certain islands in the Pacific (Candoia). There were probably true boas elsewhere in Gondwana, but they’ve since been displaced by pythons. Compare a boa constrictor and a Dumeril’s boa, and you’d be hard pressed to guess that they were separated by thousands of miles and tens of millions of years of isolation. And they’re not the only ones.